*Bob Dinneen (the Bob on the right) is the CEO of the RFA, a corn ethanol propaganda mill lobbying organization that never prints the word "corn" next to the word "ethanol." Note also that he has dropped the whole "energy independence" canard for a new one called "reduce America's reliance on oil." This is because ethanol exports (including some to the Middle East) are going ballistic because ethanol refiners are getting a better price from foreign consumers. Bob's job is to attack anything and anyone critical of corn ethanol. Environmentalists who have attacked ethanol on the basis of ILUC have relied, almost exclusively, on a highly speculative study by non-scientist, Tim Searchinger. By my count, this "non-scientist" has been published five times in the prestigious journal Science (including the above referenced study), an honor most researchers don't obtain once in their entire careers. Brace yourself Science, you are undoubtedly next on the RFA hit list. However, the latest research by Purdue University reflects the scientific community's rejection of Searchinger's initial paper that brought the ILUC issue to the front burner in February 2008. Since then, the estimated emissions purportedly occurring from ILUC penalty have fallen by nearly 90%. Rather than acknowledge the evolution of the science, Big Oil's environmentalists say nothing. "...with almost a third of the US corn crop today going to ethanol, it is simply not credible to argue that there are no land use change implications of corn ethanol." "...show that ethanol could be a somewhat better option than previously thought for reducing greenhouse gas emissions." "The third simulation, which Tyner said is probably the most accurate, reduces the amount of carbon dioxide that would be emitted by about 10 percent. But he warned that the numbers are still uncertain because the model contains many complex relationships..."
He made that up of course. There was nothing slow or tepid about it. How do you know when a politician is lying? His lips are moving, and we are all painfully aware that corporate lobbyists are the ones pulling the strings that move those lips. ...stands in stark contrast to their sustained and voracious attacks on homegrown renewable fuels such as [corn] ethanol. There is no "sustained and voracious" attack against ethanol. There is a lot of critique of corn ethanol policy, its costs to other citizens, and its environmental impacts and these critiques are coming from all over the place, not just from environmental groups (livestock farmers, food wholesalers, scientific researchers, duck hunters, recreation vehicle organizations, and on and on). And corn ethanol isn't a "renewable" fuel. About 3/4 of the energy found in a gallon of corn ethanol comes from non-renewable fossil fuels. This is largely a process that converts coal and natural gas into ethanol. Note how he will not use the term "corn ethanol" even though that is what 99% of all ethanol used in this country is made out of. Environmental organizations such as NRDC, Friends of the Earth and the Environmental Working Group have been working hand in glove with the National Petroleum Refiners Association to undermine expansion of America's renewable fuels industry. He also made that up. The corn ethanol lobby just launched a gargantuan propaganda blitz to convince congress to reinstate the blender's subsidy, which is supposed to end this year. They want it extended another five years to the tune of about $34 billion taxpayer's dollars. The blender's credit is a bribe to petroleum refiners to blend more corn ethanol than they are already forced to blend by mandate laws. They get about fifty cents for every gallon of ethanol they blend into our gas supply. Click here to see my anti-propaganda propaganda blitz. Oil companies already own a significant number of our corn ethanol refineries--liquid fuels are their bag, baby. They will own them all before it's over. This should come as no surprise. Recently, The Nation magazine, not a bastion of conservative thought, in an extensive article highlighted the close relationship between major oil companies and some of the nation's major environmental organizations. "They [the environmental organizations] take money, and in turn they offer praise, even when the money comes from the companies causing environmental devastation." The article cites Christine MacDonald, author of Green, Inc., noting, "Not only do the largest conservation groups take money from companies deeply implicated in environmental crimes; they have become something like satellite PR offices for the corporations that support them." I have stood in half-dead villages on the coast of Bangladesh while families point to a distant place in the rising ocean and say, "Do you see that chimney sticking up? That's where my house was... I had to [abandon it] six months ago." Riiight, as if the ocean has risen enough in six months to cover an entire house ...eyes rolling. This tragedy in the Gulf of Mexico is likely to be the largest ecological disaster our nation has ever experienced. It is likely to be worse than the Exxon Valdez and the 1969 Union blowout off the coast of Santa Barbara, California. The 1969 disaster helped mobilize the environmental movement, led to the first Earth Day in 1970 and paved the way for numerous environmental laws. Environmentalists focused on the importance of improving the safety of offshore oil drilling and called for ways to reduce America's reliance on oil. In the above, he finally gets something right as he describes the oil spill and praises environmental organizations (the same ones who he attacks for opposing expansion of his corn ethanol product). So far, this incident has only precipitated scorn from the environmental community toward those of us that had the temerity to state the obvious: if we invest more in renewable energy we wouldn't have to drill in ecologically-sensitive land or waters to begin with! Not true. Most scorn is directed at offshore drilling although there certainly is some directed at lobbying organizations like the RFA for trying to take advantage of this disaster to hawk their product. Environmental organizations are all for investing more in renewable energy, but as I pointed out before, corn ethanol isn't renewable. Environmental organizations are against replacing oil with something that is in its own ways worse than oil. Runoff from industrial agriculture is the primary driver of the Gulf of Mexico dead zone. It's a chronic unending, ongoing, slow-motion, ecological disaster that dwarfs this oil spill in size and longevity but does not make the headlines specifically because it is chronic and ongoing. Could it be the unholy alliance between oil interests and environmentalists? Environmentalists have spent millions of oil industry dollars to fight ethanol, concocting various strawmen and red herrings, namely Indirect Land Use Change (ILUC). And again, not true. ILUC stands for indirect land use change. Dinneen wants you to believe that you can hand over thirty thousand square miles of land to corn ethanol that was being used for other things like wildlife habitat and various food crops without it causing farmers around the world to clear more land to make up for that loss of land to grow food instead of fuel. All you need is a modicum of common sense to see that. Roughly a third of our corn crop was turned into fuel last year. Imagine the impact of turning it all into fuel. The same legislation that provided the subsidy bribe to oil companies to blend ethanol into our fuel supply set a limit of 15 billion gallons for corn ethanol's contribution to the ethanol supply for a reason. Otherwise, the RFA would happily turn all of our food into fuel. That is why high-fructose corn syrup was invented and why corn has found its way into just about everything we eat. There is no other explanation for the fact that the price of corn has remained about twice as high as historical averages for the last three years even though farmers have planted historically high amounts of it. Typically when farmers plant huge amounts of corn the price drops because supply exceeds demand. Corn ethanol is making sure demand exceeds supply. Second, and most unfortunately, this accident reminds us once again of the destructive power of oil. Are major environmental organizations so focused on climate change that they can avoid focusing on the devastation that an offshore oil accident can produce? Have they become so enamored with bringing Big Oil to the climate change negotiating table that they need to show their power by kicking ethanol, even when it is less polluting than oil [not true] and where a spill has little discernible or lasting impact on the environment [not true]? We hope that like a condemned man who finally sees the light, environmental organizations now realize that renewable ethanol [not true] represents a cleaner [not true], less polluting [not true] future. Renewable ethanol is one thing, corn ethanol is another, the Gulf of Mexico dead zone is rather irrefutable evidence of corn ethanol's longevity and impact on the environment. when compared to the search for, production, importation and consumption of oil. I for one am not holding my breath. Washington – Ethanol exports have boomed in recent months, with shipments destined for dozens of energy-thirsty nations around the globe, including some in the Middle East. The United States has been a net importer of ethanol for the last decade, but the nation is quickly evolving into a net exporter. While this is welcomed news to an industry looking for new markets, it serves to undermine the fundamental value of America’s ethanol industry as a domestic replacement for imported oil. The RFA of course has cobbled together a new list of excuses for why they are now exporting fuel, you know, like, "Well if the government won't let us force more of this down our fellow citizen's throats while simultaneously forcing them to subsidize it, then we will just have to export it to the highest bidder." Which will always be true anytime there is a higher bidder offshore, regardless of how much we are forced to consume domestically. Short of making it illegal to export our energy independence, they will export it. Here, I adapted a chart found on the Oil Drum to show how we have to expand land use to meet biofuel mandates. It shows what will happen if we stay on our present course and don't usurp rainforests and grassland carbon sinks. *Photo linked to RFA Flickr account. Taking bets this photo will soon disappear from that address. When it comes to energy produced per area of food cropland usurped, corn ethanol and soy biodiesel are the worst options available. 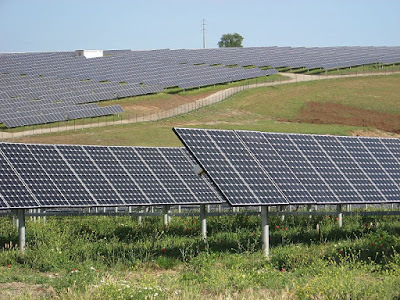 If you want to obtain energy from the sun, your best option is to grow a crop of solar panels. 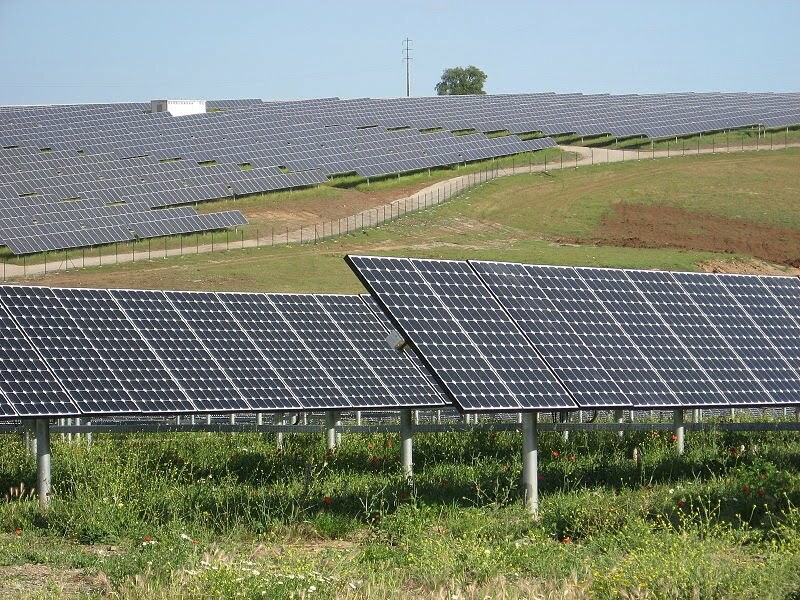 The solar farm above covers 150 acres. It nets sixty times more BTUs of energy per year than a corn crop used for ethanol and about 120 times more than a soy crop used for biodiesel. And you could still graze livestock around these panels to keep the weeds down. From a land use perspective, siting these on farmland is certainly suboptimal, but not nearly as suboptimal as converting food stock into liquid fuels. Before the mandate takes effect, the state commissioner of consumer protection, in consultation with a Distillate Advisory Board to be created under this bill, will determine whether there's enough in-state production of biodiesel to comply with the legislation. Biofuel issues usually revolve around transportation because the portability and energy density of liquid fuels are best suited for things that move around. In this case it involves homes that use oil for heating. It makes no sense, environmentally or economically, for state governments to force citizens to purchase biofuels regardless of cost. If biodiesel cost less, consumers would already be using it. In the summer of 2008 biodiesel was selling for $6 a gallon. This is essentially a hidden tax on citizens and a form of wealth redistribution to farmers. Biofuel lobbyists have obviously gotten the ear of some politicians. No politician would dream of increasing taxes at this point in time to fund something like this. So, instead, the cost is hidden in consumer fuel bills. If global warming is the real concern, there is much more bang for the buck in solar or even better yet, home weatherization. Connecticut is not known as an agricultural powerhouse, so this does not make a whole lot of sense the way it might in corn and soy growing states, where such legislation is being used by politicians to buy votes. The public is largely unaware of the futility and wastefulness of trying to displace oil by turning food into a liquid fuel. Maria Cantwell recently introduced legislation in my home state to reinstate the dollar per gallon blending subsidy for biodiesel to placate the biodiesel refinery here. A back-room deal was struck where they would pretend to use oil grown in Washington State instead of importing the cheapest oil as the original business plan dictated (and why it is built on a port). I recently attended a talk sponsored by the Northwest Biodiesel Board. An Eastern Washington professor, who was raised on a farm and had attempted his own biodiesel business, explained that politicians had not considered the Washington State farmer's ability to competitively grow corn and soy. The climate here favors other higher value crops like apples and cherries.